I used this photo as a reference for a pen drawing I did. ok i have a question. i have been planning a halloween party and have been thinkin on how i want to decorate and wat i want to be. could i use ur eye make up on myself...? Damn, this picture is so effin dope. I wanted to use it for a club flyer. some flyer's on my own to demonstrate what I can do. But ill respect your wishes. Great idea for the make up ! and it's a good shoot too. Hi! I just wanted to let you know that your lovely work has been featured here [link] in my journal. I feel like drawing you. I love this picture ! Really ! this is a damn fine work ! 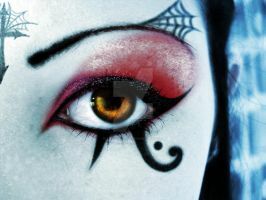 make up really applied good, I love your idea to draw the "fire lines" the way you did under the eye.. I love the crop of your face you chose for the photo.. I wonder what you use for lighting? Cool pic. Nice look, great colours, and terrific angle. Wow that is really great make-up! I love the design and the color and the shadowing! Well done! Very nice ! I love the shapes. Great job. You'll inspire many.